The orbits of the Russian meteor and Asteroid 2012 DA14 are nothing alike meaning they are not related. NASA has revealed the first radar video of an asteroid flyby that sent a space rock half the size of a football field buzzing by Earth last week. The new asteroid flyby video, released today (Feb. 19), shows the asteroid 2012 DA14 as it headed away from Earth over the weekend. The asteroid zipped close by Earth on Friday (Feb. 15), when it approached closer to the planet than many communications satellites. Before Friday's flyby, astronomers suspected asteroid 2012 DA14 was about 150 feet (45 meters) across. At its closest point, the asteroid came within 17,200 miles (27,000 kilometers) of Earth, but never posed a threat of impacting the planet. Based on the new radar observations, scientists now think asteroid 2012 DA14 is about 130 feet (40 m) wide at its largest point, NASA officials said in a statement. This collage of 72 individual radar-generated images of asteroid 2012 DA14 was created using data from NASA's 230-foot (70-meter) Deep Space Network antenna at Goldstone, CA. "The images span close to eight hours and clearly show an elongated object undergoing roughly one full rotation," NASA officials explained. During that eight hours, asteroid 2012 DA14 moved even farther from Earth to a point about 195,000 miles (314,000 km) away. Astronomers Lance Benner and Marina Brozovic at NASA's Jet Propulsion Laboratory in Pasadena, Calif., led the radar observing campaign for the asteroid flyby. They planned to conduct a series of follow-up observations on Feb. 18, 19 and 20. Asteroid 2012 DA14 was discovered in February 2012 by amateur astronomers at the La Sagra Observatory in Spain. Its close flyby was determined soon afterward, and astronomers ultimately found that it posed no chance of hitting the Earth. NASA scientists and astronomers around the world tracked asteroid 2012 DA14 as it approached Earth over the last week, with the space agency and several groups holding public webcasts to chronicle the space rock's close shave. It was the closest flyby of an asteroid the size of 2012 DA14 that astronomers have known about in advance. 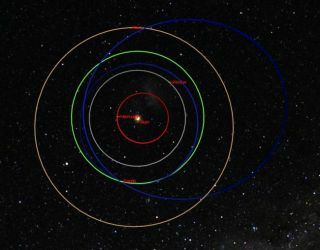 Asteroid 2012 DA14 came about 5,000 miles (8,046 km) closer to Earth than the fleet of communications satellites that fly in geosynchronous orbits about 22,400 miles (36,000 km) above the planet. NASA provided satellite operators with regular updates on the asteroid's position and path in case the satellites would have to be moved clear of the space rock. NASA and a network of scientists around the world regularly monitor the night sky for signs of asteroids that could pose an impact threat to the Earth. NASA scientists have said the trajectory of the meteor was different than that of asteroid 2012 DA14, and that the two events were unrelated. Subsequent fireball sightings over the San Francisco Bay Area and Miami, Fla., were also unrelated.